For children’s bone pathologies (tumors, non-union fractures, distraction), the development of ultrasonic imaging modalities is important challenges in order to provide an alternative to others imaging technics. Conventional modalities such as X-ray radiology or Computed Tomography (CT) which must be limited due to their radiation hazard. Magnetic Resonance Imaging is a major tool but require more frequently anesthesia  than CT and give poor cortical information. Nowadays, the B-mode ultrasound is the first-line examination for the diagnosis of many children’s diseases. Due to its efficiency, the B-mode ultrasound is particularly dedicated to pediatric use, allowing to increase the number of procedures without harmful effects. However, B-mode ultrasound has difficulty penetrating bone and, therefore, can only see the outer surface of bony structures, and not what lies within them. 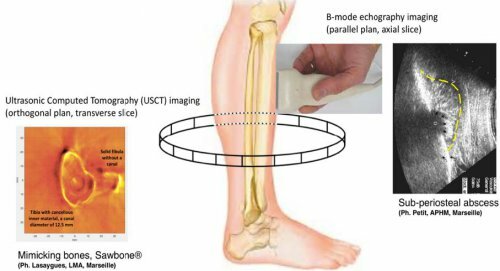 A new and relevant research axis is then proposed in this PhD thesis : to develop an ultrasonic diagnostic modality for pediatric bone imaging with a parametric characterization of bone lesion. For several years, the Laboratory of Mechanics and Acoustics has been studying the diffraction-mode ultrasonic imaging of biological tissues. The developed methods are based on the ultrasonic computed tomography (USCT) principles provide images of soft medium. The acquisition geometry of the signals is no longer linear, as in Bmode ultrasound, but circular in the orthogonal plane, and based on a multi-channel and multi-frequency antenna. The main difficulty of the USCT applied in the case of bone imaging is the large impedance contrast between echogenic structures and the surrounding soft tissues. In that context, approximation methods commonly for soft tissues fail to provide quantitative images. We have then suggested a purely numerical non-linear inversion algorithm, and the minimization procedure between the full recorded and simulated data is solved. The main objective of the PhD thesis is to develop a real prototype of predictive analysis and diagnosis of the pediatric skeleton based on USCT. The locks associated with an in vivo configuration are still numerous : the number of transducers, the power and the intensity of the wave, the image resolution and the contrast in the deep zone, the accessibility of non-peripheral skeletal sites, or in between the two leg and arm bones, and the muscle and soft tissue effect in term of dispersion and attenuation of the wave. More information (work plan and scientific references) in this attached file.